TRG blog: Who’s a Scalper? Sign from the Vancouver Folk Music Festival. The secondary ticket market is a hot button issue across the performing arts and broader ticketed-event universe. Anything this huge has to be. The New York Times recently estimated that ticket sales through brokers and other resellers “is a $4.5 billion business nationwide.” Revenue of this magnitude in a sector with few barriers to entry likely means that further growth is inevitable. After attending a long series of arts conferences this year where experts from the field have talked insistently about the evils of the secondary ticketing market, one has to wonder: Do ticket brokers have mothers? Surely, only a mother could love these people. The list of pejoratives is lengthy. 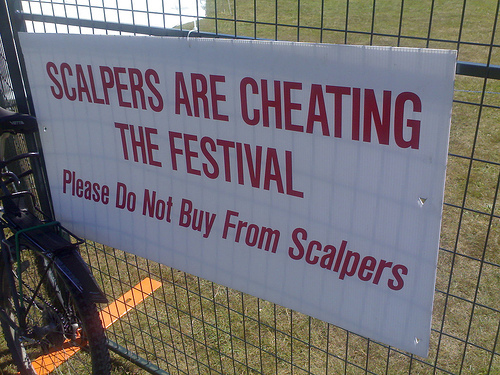 “Scalper” is one of the kinder terms. Thus my question: Who’s a scalper? For some, the answer is simple. Brokers are bad and the only solution is to legislate them out of existence. Yes, some operators engage in shady business practices. For me, those who sell online using sites designed to deceive the customer should be dealt with by the justice system. The Federal Trade Commission (FTC) prohibits unfair or deceptive business practices. Fraudulently pretending to be a primary ticketing outlet certainly exceeds my ethical threshold even if it escapes the long arm of the law. For the moment, let’s set aside the issues of how fraudulent dealers get away with their practices. We’re in an era in which a newly “illegal” server can become instantly legal by relocating to another state or country with just a few keystrokes. Instead, consider this: For every transaction completed by broker, there is a patron – a fan! – who is making a purchase. The only reason the secondary market exists is because someone needs a seat for that “can’t miss” event or performance. Now consider the short list below and ask yourself: Who is the legitimate fan and who is the scalper? I'm a subscriber who can't attend the next performance in my series and a friend offers to buy them from me. I'm a ticket seller who occasionally helps my friends get tickets outside of the normal channels. I’m a hotel concierge who helps guests obtain tickets to sold-out events. I earn bigger tips in exchange for finding a way to get better seats or earlier access than presenters typically allow. I'm an artist, promoter, or presenter who makes tickets available to fan club members. These transactions may not even be available through the house ticketing system. I may also allocate tickets to a broker, who pays me full price plus a percentage of any price above "retail". I’m a small business operator. I’m a ticket speculator. I take huge risks by subscribing, becoming a donor, a "group" organizer or member of your organization for the sole purpose of obtaining ticket inventory that I intend to resell at a price greater than face value. Using a variety of techniques, I may buy thousands of tickets each month or year. I’m a software developer whose application can force its way into a ticketing system to simultaneously buy blocks of prime inventory while blocking others from accessing the system. For me, the conversation demonizing resellers exists on a slippery slope. Some situations appear ethically clear-cut while others obviously less so. However, they all share common factor: A willing buyer. And like all of the world’s oldest professions, the seller only exists to satisfy the perceived need of a buyer. Legislation has never been much of a deterrent when a willing buyer seeks a willing seller. That’s why some professions have lasted for a very long time. This is just the beginning of our view in this debate. Comments? Are Scalpers Winning the Gold at the London Olympics?